The puss moth caterpillar (Megalopyge opercluaris) and other members of the genus Megalopyge are known throughout the new world for their urticating (producing a stinging or itching sensation) hairs and spines and their painful sting. 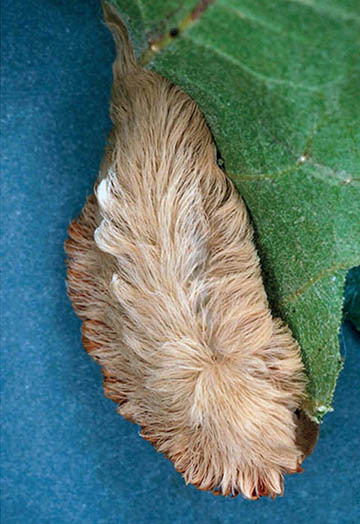 The puss moth caterpillar is covered in a coat of tawny to grayish hairs. The body is roughly 1 inch (2.5 to 3.5 cm) in length but may be smaller. 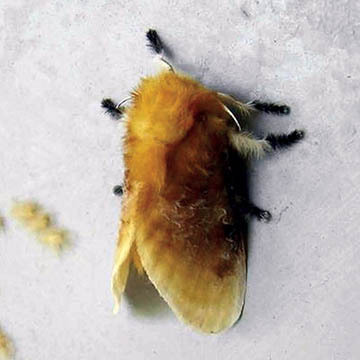 This moth is distributed throughout the southern states and has been found as far north as New Jersey. It has been collected on hackberry (Celtis occidentalis), elm (Ulmus spp. ), sycamore (Platanus occidentalis) and oak (Quercus spp.) trees as well as cultivated and wild plum (Prunus spp.) and rose bushes (Rosa spp.). The spines lie just underneath urticating hairs. On contact, the spines will break away, releasing venom. Stings are typically multiple as these caterpillars are commonly stepped on, touched or lodged in clothing. Puss caterpillar stings are instantaneously painful, quickly followed by localized pain that radiates toward regional lymph nodes. 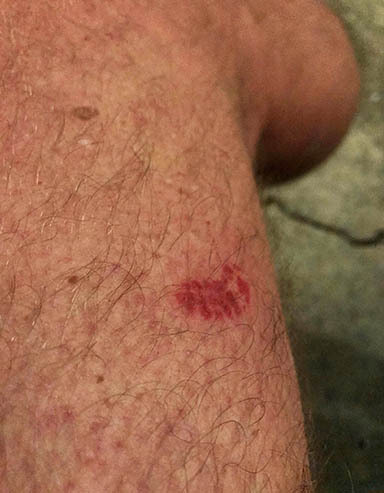 In the individual puncture sites that often become red, swollen and pustular (containing blisters on skin), making an outline of the caterpillar. Allergies to these stings have been documented, and persons stung should be watched for any potential anaphylactic reaction. Other symptoms that are documented include headache, fever, nausea, vomiting, heart arrhythmia (abnormal heart beat), hypotension (low blood pressure), acute abdominal pain and muscle spasms. To relieve pain, antihistamines should be taken and a cold compress applied. The pain can last over 24 hours. Remove urticating hairs and spines using adhesive tape. Wash the stung area with soap and water or a sterilizing agent and allow to air dry. If you suspect an allergic reaction, or if stung regions are accompanied by abdominal pain and intense muscle spasms, see a doctor for appropriate medical attention. Puss moth caterpillars have two generations a year. Adults emerge in April, with the first generation of caterpillars appearing between May and July. The second generation appears between the end of July and the end of October, and they pupate through the winter, emerging the following April. These caterpillars are particularly troublesome when they infest shade trees in towns and cities as the low branches increase the likelihood of a physical encounter. Major infestations are rare. Natural enemies provide good biological control, but chemical control is available. Contact the LSU AgCenter for information on chemical control. Diaz, James H. 2005. The epidemiology, diagnosis, and management of caterpillar envenoming in the southern US. The Journal of the Louisiana State Medical Society: Official Organ of the Louisiana State Medical Society 15: 153-157. D. K. Pollet and Ring, D. R. 2006. Stinging Caterpillars. Bug Biz. Pub 1979. 2 pgs.